Summary and Definition: The Shasta tribe were a California tribe of Native American Indians who were hunters and fishers. The Shasta people lived in Northern California on the Oregon border (Siskiyou County). They were a semi-nomadic people who hunted in the summer, building wigwams (wikiups) as temporary shelters in the winter lived in semi-subterranean oblong pit houses. What was the lifestyle and culture of the Shasta tribe? The Shasta people consisted of different bands including the Katiru, Iruwaitsu, Kammatwa, Kikatsik, Konomihu, New River Indians, and the Okwanuchu. Shasta villages were located at the mouths of creeks which flowed into the Shasta, Klamath, or Scott rivers. Although most of the Shasta lived in California some members of the tribe lived on the north side of the Siskiyous in Oregon on tributaries of Rogue River known as Stewart River and Little Butte Creek. The Shasta tribes lived semi-nomadic lifestyles, hunting for food in the summer living in temporary shelters called wikiups. The winter homes were permanent, rectangular, pit house structures. The Shasta utilized broad, clumsy dugout canoes for fishing. Conflicts arose between the tribe and the gold rush settlers due to the encroachment of their tribal lands and the devastating epidemics brought by the Europeans. What language did the Shasta tribe speak? The Shasta tribe spoke in the Shastan dialect, part of the Hokan language. Where did the Shasta tribe live? The Shasta are people of the California Native American cultural group. The geography of the region in which they lived dictated the lifestyle and culture of the Shasta tribe. What did the Shasta tribe live in? Wikiups: During the summer the semi-nomadic California Shasta tribe lived in temporary brush shelters of dome-shaped flimsy huts covered with rushes or bunches of grass called wikiups. The materials used were sagebrush, willow, branches, leaves, and grass (brush) that were available in their region. Winter Pit Houses / Earth Lodges: The more permanent winter homes of the Shasta consisted of villages of rectangular, semi-subterranean winter homes that were set about three feet into the ground called an 'umma'. The pit house was constructed of dirt sidewalls, wood end walls and a pitched roof. The winter houses had a central fire pit. An opening in the roof allowed the smoke to escape and also let light and air in. Each Shasta village had a big meeting house called an okwa-umma and a the sweat house called a wukwu. What clothes did the Shasta men wear? 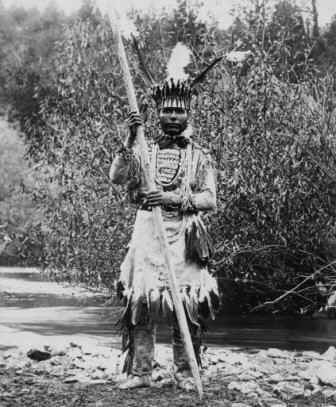 The clothes worn by the men of the Shasta tribe varied according to the season. During the warm summer months few, if any, clothes were worn by the men who were happy to hunt naked. In the colder winter months different items of clothing were made from the hides and pelts from animals such as deer (buckskin), elk, squirrel, rabbit and beaver. The items of clothing included warm fur robes, wrap-around kilts or aprons, mitts, leggings and shirts. Some of their clothes, particularly leggings were decorated with fringes. They wore one-piece moccasins with a front seam whilst hunting or traveling, but usually went barefoot in their own villages. Upright, crown style headdresses were worn by the men on special occasions. The crown style headdresses consisted of the flicker feather headband, a feather crown and a feather plume. The complex head-dress was made from from beads, shells, skins, quills and feathers which were attached to headbands that sometimes included upright radiating small wooden sticks. The quill headbands of the crown headdresses covered the forehead and were tied at the back. (The flicker bird is a member of the woodpecker family). The Flicker headbands were made from flicker primary feathers, the longest and narrowest on the wing. These dark pink or yellow feathers were placed side by side and sewn together to form a long headband. These were bordered by dark brown feathers and attached to the head with twined string. Feather hair plumes and hairpins were added to the crown headdress as a separate form of decoration. The feather plume was tied on a stick. The plume either covered the whole of the stick, or feathers might only be attached just to the end of the stick. A full middle plume might be worn with two small side plumes. Another style of the crown headdress included a circular head roll or circlet that was made of bound tule and often covered with fur. These were often ornamented with horizontal pegs made of quills, often with beads and shells attached. Long feathers were attached to two small wooden rings to form an erect cylinder crown. What clothes did the Shasta women wear? The clothes worn by the women of the Shasta tribe consisted of blouses and front and back aprons of shredded willow bark, falling to calf length between the ankle and knee, belted, fringed and special clothes were strung with ornaments and porcupine quills. Twined tule sandals or moccasins covered their feet. Shasta women wore woven basket caps but would also wore crown style headdresses when they participated in dances and ceremonies. In the winter the women wore fur cloaks to keep them warm. Both the men and women wore ornaments, especially necklaces, made from beads, shells and bird claws. The men favored bear claws and elk teeth. The people wore tribal tattoos on their faces and bodies. 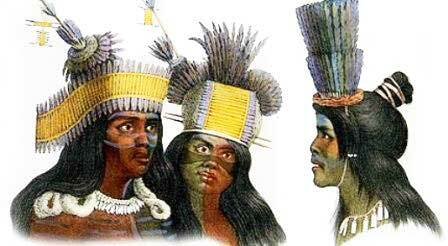 Shasta women had three wide stripes tattooed on their chins. Grease was mixed with black charcoal, white chalk powder, red and yellow dyes to make face and body paint. Both the men and women had nose and ear piercings. Special feather cloaks and skirts were used during ceremonies made from the tail and wing feathers of birds such as magpies, crow, turkey, vulture and hawk. What weapons did the Shasta use? The weapons used Obsidian was abundant throughout the Shasta territory and was used to make arrowheads, spear points, knives, and scrapers. Rattlesnake venom was used by the tribe as a poison for their arrows which were marked with a blue streak. The Shasta used a form of body armor made of hard elk or bear hide and slender sticks wrapped together was worn by the warriors. The enemies of the Shasta were the neighboring Achomawi, Wintun, and Modoc tribes. What food did the Shasta tribe eat? The food that the Shasta tribe ate included fish, principally trout, salmon and mussels. Hunters also supplied meat from deer (venison), elk and bear. California black and white oak trees and the tan oaks provided an abundance of acorns which were leeched in water or left until they turned black in order to remove the bitter tannic acid. The acorns were then roasted and eaten whole or ground into acorn meal which was used to make bread. The Shasta employed different cooking methods when preparing salmon. It was was roasted for immediate meals or smoked, dried so it could be stored for future use. The bones of the salmon were crushed and stored and made into soup when hunting was scarce. Sugar Pine nuts were steamed in earthen ovens then dried and stored for later use in making cakes or mixing with dried powered salmon. Manzanita berries were used to make a cider-like beverage. Large animal meat was cooked by boiling, baking in earth ovens or broiling over hot coals or an open fire. Insects such as crickets, grasshoppers, caterpillars and locusts were baked. As the white settlers encroached on their lands acorns became very difficult to obtain because the oak trees were being cut down to create white settlements. Shasta History Timeline: What happened to the Shasta tribe? The following history timeline details facts, dates and famous landmarks of the people. The Shasta timeline explains what happened to the people of their tribe. 1870: Spread of the Big Head Cult Movement - "The Ghost Dance Ceremony"